A gmdistribution object stores a Gaussian mixture distribution, also called a Gaussian mixture model (GMM), which is a multivariate distribution that consists of multivariate Gaussian distribution components. Each component is defined by its mean and covariance, and the mixture is defined by a vector of mixing proportions. You can create a gmdistribution model object in two ways. Use the gmdistribution function (described here) to create a gmdistribution model object by specifying the distribution parameters. Use the fitgmdist function to fit a gmdistribution model object to data given a fixed number of components. gm = gmdistribution(mu,sigma) creates a gmdistribution model object using the specified means mu and covariances sigma with equal mixing proportions. gm = gmdistribution(mu,sigma,p) specifies the mixing proportions of multivariate Gaussian distribution components. Means of multivariate Gaussian distribution components, specified as a k-by-m numeric matrix, where k is the number of components and m is the number of variables in each component. mu(i,:) is the mean of component i.
Covariances of multivariate Gaussian distribution components, specified as a numeric vector, matrix, or array. Given that k is the number of components and m is the number of variables in each component, sigma is one of the values in this table. m-by-m-by-k array sigma(:,:,i) is the covariance matrix of component i. 1-by-m-by-k array Covariance matrices are diagonal. sigma(1,:,i) contains the diagonal elements of the covariance matrix of component i.
m-by-m matrix Covariance matrices are the same across components. 1-by-m vector Covariance matrices are diagonal and the same across components. Mixing proportions of mixture components, specified as a numeric vector of length k, where k is the number of components. The default is a row vector of (1/k)s, which sets equal proportions. If p does not sum to 1, gmdistribution normalizes it. If you create a gmdistribution object by using the gmdistribution function, then the mu input argument of gmdistribution sets this property. If you fit a gmdistribution object to data by using the fitgmdist function, then fitgmdist estimates this property. If you create a gmdistribution object by using the gmdistribution function, then the sigma input argument of gmdistribution sets this property. Mixing proportions of mixture components, specified as a 1-by-k numeric vector. If you create a gmdistribution object by using the gmdistribution function, then the p input argument of gmdistribution sets this property. Type of covariance matrices, specified as either 'diagonal' or 'full'. If you create a gmdistribution object by using the gmdistribution function, then the type of covariance matrices in the sigma input argument of gmdistribution sets this property. If you fit a gmdistribution object to data by using the fitgmdist function, then the 'CovarianceType' name-value pair argument of fitgmdist sets this property. Distribution name, specified as 'gaussian mixture distribution'. Number of mixture components, k, specified as a positive integer. If you create a gmdistribution object by using the gmdistribution function, then the input arguments mu, sigma, and p of gmdistribution set this property. If you fit a gmdistribution object to data by using the fitgmdist function, then the k input argument of fitgmdist sets this property. Number of variables in the multivariate Gaussian distribution components, m, specified as a positive integer. If you fit a gmdistribution object to data by using the fitgmdist function, then the input data X of fitgmdist sets this property. Flag indicating whether a covariance matrix is shared across mixture components, specified as true or false. If you fit a gmdistribution object to data by using the fitgmdist function, then the 'SharedCovariance' name-value pair argument of fitgmdist sets this property. The following properties apply only to a fitted object you create by using fitgmdist. The values of these properties are empty if you create a gmdistribution object by using the gmdistribution function. Akaike information criterion (AIC), specified as a scalar. AIC = 2*NlogL + 2*p, where NlogL is the negative loglikelihood (the NegativeLogLikelihood property) and p is the number of estimated parameters. AIC is a model selection tool you can use to compare multiple models fit to the same data. AIC is a likelihood-based measure of model fit that includes a penalty for complexity, specifically, the number of parameters. When you compare multiple models, a model with a smaller value of AIC is better. This property is empty if you create a gmdistribution object by using the gmdistribution function. Bayes information criterion (BIC), specified as a scalar. BIC = 2*NlogL + p*log(n), where NlogL is the negative loglikelihood (the NegativeLogLikelihood property), n is the number of observations, and p is the number of estimated parameters. BIC is a model selection tool you can use to compare multiple models fit to the same data. BIC is a likelihood-based measure of model fit that includes a penalty for complexity, specifically, the number of parameters. When you compare multiple models, a model with the lowest BIC value is the best fitting model. Flag indicating whether the Expectation-Maximization (EM) algorithm is converged when fitting a Gaussian mixture model, specified as true or false. You can change the optimization options by using the 'Options' name-value pair argument of fitgmdist. 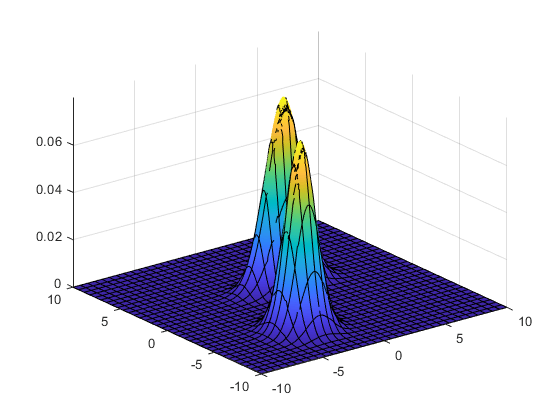 Negative loglikelihood of the fitted Gaussian mixture model given the input data X of fitgmdist, specified as a scalar. Number of iterations in the Expectation-Maximization (EM) algorithm, specified as a positive integer. You can change the optimization options, including the maximum number of iterations allowed, by using the 'Options' name-value pair argument of fitgmdist. Tolerance for posterior probabilities, specified as a nonnegative scalar value in the range [0,1e-6]. The 'ProbabilityTolerance' name-value pair argument of fitgmdist sets this property. Regularization parameter value, specified as a nonnegative scalar. The 'RegularizationValue' name-value pair argument of fitgmdist sets this property. Create a two-component bivariate Gaussian mixture distribution by using the gmdistribution function. Define the distribution parameters (means and covariances) of two bivariate Gaussian mixture components. The cat function concatenates the covariances along the third array dimension. The defined covariance matrices are diagonal matrices. sigma(1,:,i) contains the diagonal elements of the covariance matrix of component i. Create a gmdistribution object. By default, the gmdistribution function creates an equal proportion mixture. List the properties of the gm object. You can access these properties by using dot notation. For example, access the ComponentProportion property, which represents the mixing proportions of mixture components. A gmdistribution object has properties that apply only to a fitted object. The fitted object properties are AIC, BIC, Converged, NegativeLogLikelihood, NumIterations, ProbabilityTolerance, and RegularizationValue. The values of the fitted object properties are empty if you create an object by using the gmdistribution function and specifying distribution parameters. For example, access the NegativeLogLikelihood property by using dot notation. After you create a gmdistribution object, you can use the object functions. Use cdf and pdf to compute the values of the cumulative distribution function (cdf) and the probability density function (pdf). Use random to generate random vectors. 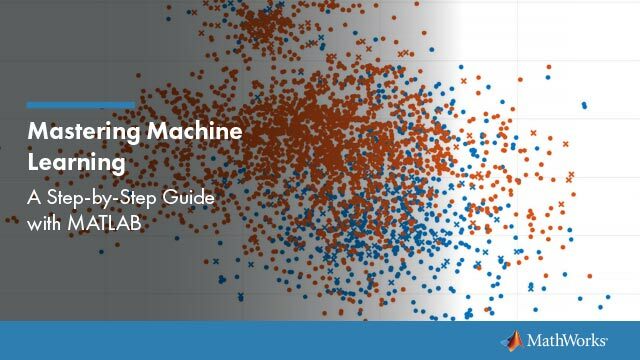 Use cluster, mahal, and posterior for cluster analysis. Visualize the object by using pdf and fsurf. Generate random variates that follow a mixture of two bivariate Gaussian distributions by using the mvnrnd function. Fit a Gaussian mixture model (GMM) to the generated data by using the fitgmdist function. Generate an equal number of random variates from each component, and combine the two sets of random variates. The combined data set X contains random variates following a mixture of two bivariate Gaussian distributions. Fit a two-component GMM to X. You can access these properties by using dot notation. For example, access the NegativeLogLikelihood property, which represents the negative loglikelihood of the data X given the fitted model. After you create a gmdistribution object, you can use the object functions. Use cdf and pdf to compute the values of the cumulative distribution function (cdf) and the probability density function (pdf). Use random to generate random variates. Use cluster, mahal, and posterior for cluster analysis. 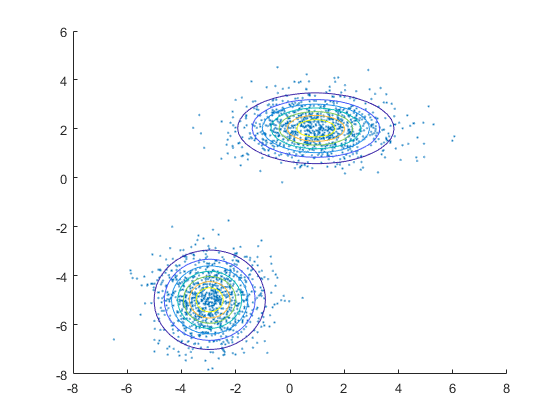 Plot X by using scatter. Visualize the fitted model gm by using pdf and fcontour. McLachlan, G., and D. Peel. Finite Mixture Models. Hoboken, NJ: John Wiley & Sons, Inc., 2000.